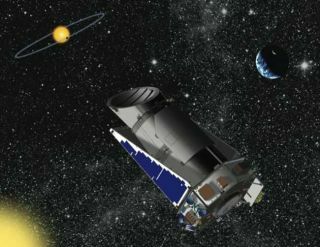 NASA's newest planet-hunting spacecraft Kepler is in goodshape to begin discovering Earth-like planets, according to its first scienceresults, released today. The space telescope, launchedin March 2009, detected the giant extrasolar planet HAT-P-7b within itsfirst 10 days of taking data. Although this planet was previously discovered byground-based telescopes, the fact that Kepler found it and measured it in suchgreat detail bodes well. Kepler is ona quest to root out distant worlds that resemble our own Earth, and whichmight be hospitable to life. So far, the various Earth- and space-based planet-huntingtelescopes are only able to find worlds that are significantly larger andhotter than our own, because they are easier to see. But Kepler was designed tobe capable of detecting a distant Earth-sizedplanet in an Earth-like year-long orbit, which would give it roughly thesame temperature range as our home. The preliminary results indicate the observatory is up andrunning as expected. "This tells us that Kepler has the photometricprecision necessary to see Earth-like planets," said Jon Jenkins, a Keplerco-investigator at the SETI Institute in California. "Kepler's prospectsfor detecting Earth-sized planets transiting Sun-like stars are good: Theinstrument is performing much as expected." Planet HAT-P-7b is nothing at all like Earth. This gas giantworld circles its star every 2.2 days in a tight orbit that heats up theplanet's surface to a boiling 4,310 degrees Fahrenheit (2,376 degrees Celsius). "It is as hot as a glowing red heating element in yourstove or toaster," said David Koch, Kepler deputy principal investigatorat NASA Ames Research Center in California. "That means we can see lightfrom the planet itself." As Kepler watched HAT-P-7b's host star, the telescopeobserved a dip in the star's brightness as the planet passed in front of it inwhat's called a transit, blocking some of the star's light. Kepler also noted asmaller dip in light when the planet passed behind the star, because theplanet's small contribution to the total brightness was briefly shielded. Previous observations of HAT-P-7b were not able to measurethis second, smaller effect, called an occultation. "The depth of the signal from that occultation, thattiny blocking of the light from the planet itself, is about the same as atransit would be for a planet as small as Earth," Koch told SPACE.com. "So we measured the same kind of signal as if we were detecting an Earthby seeing this occultation." That's good news for the Kepler team, although theEarth-like discovery that scientists dream about will have to wait a while.Since Kepler looks for transiting planets that produce very limited signals, atleast a few orbits must be completed before a signal is noticeable. In the case of HAT-P-7b, this requires only a few days, butfor a truly Earth-like planet in an Earth-like 365-day orbit, about three yearswill be necessary to discern a pattern. Kepler was launched in March 2009 on a 3.5-year mission,which scientists hope to extend if all goes well. The telescope is designed toscan one portion of the sky, looking at about 100,000 stars simultaneously toseek signs of planets temporarily obscuring their light. Astronomers hope themission will yield small terrestrial planets in what's called the habitablezone, where a planet is not too far or too close to its star and itstemperature range is similar to Earth's and can host liquid water. "Our mission is designed so that if Earths inEarth-like orbits are common we expect to find as many as [roughly] 50 suchplanets," Jenkins said. If the mission is successful, humans could be a step closerto finding alien life in the universe. No matter what it finds, the resultswill be revealing. If Kepler completes its term without finding any Earth-likeplanets, it could suggest that Earth, and life, are unique or at least special. The Kepler team, led by principal investigator WilliamBorucki at NASA Ames, detailed Kepler's first results in a paper published inthe Aug. 7 issue of the journal Science.